This write up on Agra weather highlights the weather and climate of Agra during different periods of the year. Like most cities of North India, the weather and climate of Agra is extreme and tropical. In Agra and surrounding areas, summers are extremely hot and the maximum temperature goes as high as 45º Celsius, while the weather during winter remains cold and foggy at times. During the Monsoon season, Agra city receives heavy rains and the weather becomes hot and humid. Overall, the climate of Agra can be summed up as extreme i.e. mercury rises too high in summers and during the winter months of Dec-January the weather of Agra becomes cold. You can visit the Agra city during any part of the year but it is recommended that one must avoid the extreme hot summers (April-June) and rainy season (July-Sept). 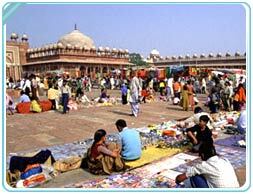 Thus, the most suitable time to visit Agra, the city of the Taj Mahal, is during winters.